"My grandmother makes this dish all the time and my husband loves it! For a vegetarian variation, use 1 teaspoon vegetable oil instead of bacon and follow same directions." Saute bacon in a medium skillet; when it is half done, add onion and saute until lightly caramelized and bacon is done. 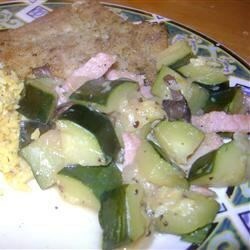 Add squash and zucchini and brown lightly on both sides. Season with salt and pepper to taste and pour in water. Reduce heat to low, cover pan and simmer for about 15 to 20 minutes, or until tender. Try this grilled summer squash dish that is topped with fresh, spicy chorizo. Very good! I used some Marsala wine instead of water and it turned out great...will definitely make this again!